We supply a lot of timber lean-tos and are confident we can help you find the perfect design for your garden or outdoor area. Our wooden lean-to Finch, Dove and Heron designs are made to bespoke specifications that will fit any extension or patch of land over 4ft 6ins in length. Once you have decided which of our models of wooden lean- to sheds you desire, we can get to work tailoring and installing it for you. Once installed, you can start growing vegetables or plants to provide extra organic food for your meals. 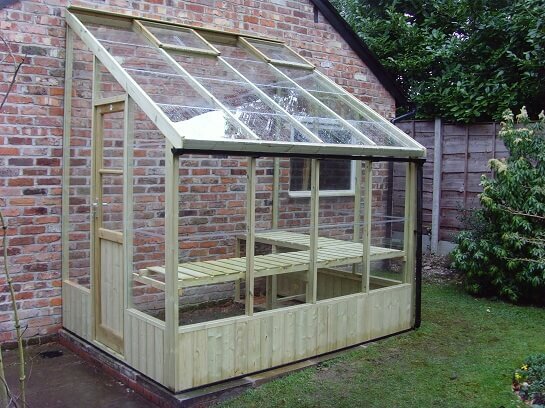 Or you can turn the lean-to wooden greenhouse into a warm and relaxing spot to observe nature. You may even want to incorporate both ideas, creating a wonderful seating area surrounded by plants that will become your pride and joy. We offer a variety of roof heights at increments to suit the design of your house and garden. Each timber lean-to comes with optional extras, from gutters to shelving.